I’m sure you’ll agree that a reptile terrarium must have enough space for your pets, be well contstructed, affordable, and a strong quality product. That was our top criteria for selecting the best reptile terrarium. If you want to cut to the chase, the Exo Terra all glass terrarium has a raised bottom frame that accommodates a substrate heater. The bottom is waterproof to protect the heater and provides additional safety and longevity. Reptiles and amphibians are fairly common to own as pets but they need a special environment and habitat to thrive well. 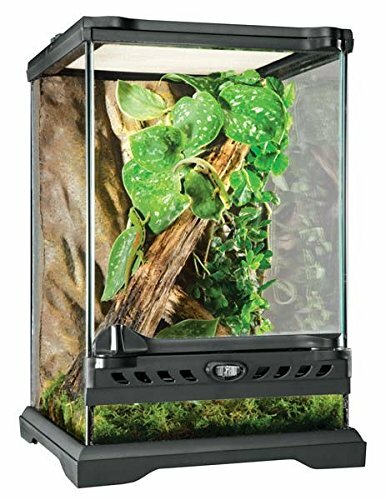 These top rated terrariums are designed for these exotic animals, created to provide the safest and healthiest home that mimics their real habitats as closely as possible. There is a lot to learn about creating the right environment for a reptile or amphibian. They are not like dogs, cats or rabbits. Any of these top rated terrariums are a great choice for your pet’s home. With plenty of space and special features designed just for that type of animal, your pet is sure to love their space. You’ll learn all about how to choose the right terrarium for your amphibians and reptiles in the buyer’s guide we have provided for you. It goes into detail about how to choose the perfect terrarium for your needs and how to access what those needs are. Exo Terra Terrariums are high quality habitats for your reptiles and amphibians. They have many different models available for your needs and preferences. This All glass terrarium has a raised bottom frame where you can put a substrate heater. The bottom is also waterproof for safety and longevity. There are two doors on the front that swing out for your convenience when you need to access the terrarium or your pets. The dual doors lock securely and are escape proof, a very good thing so you don’t have reptiles and amphibians running loose around the house. There is front window ventilation that is a patented design from Exo Terra. This ventilation is very good for the health and comfort level of your pets. The closeable inlets keep wires and tubing managed and not hanging all over and getting in the way. The top is a full screen which provides the ability to watch the pets as well as giving them plenty of ventilation. It also allows UVB and infrared rays to get in which is also important for the health of your terrarium loving pets. You can easily clean the terrarium by removing the full screen lid or add more decorations for your pets. The natural background is the same color and provides an extra dimension that can be used for climbing. This terrarium is chosen above many others due to the convenient design, excellent construction and features it provides. The open air screen cage is the perfect home for small species of juvenile green iguanas, geckos, anoles and old world chameleons. The large front door gives the pet owner easy accessibility to the cage and the bottom door makes substrate removal easy as well. The black anodized aluminum screen cage is attractive and constructed from corrosion resistant aluminum. All of the hardware you need to assemble this terrific terrarium is included and all you need for assembly is a screw driver. This reptile terrarium provides plenty of ventilation, the ability to see them in their natural habitat and it’s easy to clean too. The all screen design is great for being able to really interact with your pets and see them from all angles. The Zoo Med Reptibreeze is available in 4 different sizes so you can match the one you choose with the size and amount of animals you need to house. There’s plenty of room for accessories, climbing things, reptile dens, food dishes and more. Exo Terra does it again with the Glass Natural Terrarium. It is the perfect place to house your amphibians or reptiles. The front opening on the terrarium makes cleaning, and refilling food and water dishes convenient and easy. You won’t have to worry about your pets escaping thanks to the specially designed lock that is on the door. Your reptiles and amphibians will get the benefits from the UVB and infrared lights you put over the top of the terrarium (lights sold separately) due to the full screen lid that goes on top. This lid can also be removed for easy access. The fixed front lower panel is very high which means you can use thick layers if substrate. It also gives you room for the Exo Terra Reptile Den (sold separately). You even have room to build a water feature. The terrarium has been tested thoroughly for leaks so that is not a problem you will have to worry about. The Exo Terra Natural Glass Terrarium is much deeper than the traditional aquarium fish tank which gives extended ground surface for the reptiles and amphibians that are ground dwellers. With the raised bottom glass panel, you can easily mount a substrate heater. The raised bottom eliminates typical problems that can happen with standard “fish tank” style terrariums. You will have better and more even ventilation and not have to deal with hot or cold spots. It is important to have the proper habitat for your reptiles and amphibians so they stay healthy and safe. 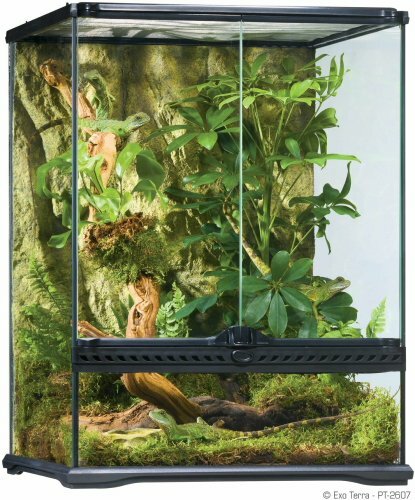 Any one of these top rated terrariums could be the perfect new home for your reptile and amphibian pets. The design and construction of all three terrariums provide ample space for your pets as well as easy access to cleaning and interacting with them. The brand names are names you can trust and are customer favorites for all of the features and benefits they provide to the animals that are housed in them. There is a lot to learn about choosing the right terrarium for your reptiles and amphibians. Below we have provided a detailed buyer’s guide for you that will give you all the important information you need to make choosing a terrarium much easier. Continue reading to gain some very beneficial knowledge on how to choose the right home for your reptiles and amphibians and also learn about keeping your exotic pets healthy and happy. 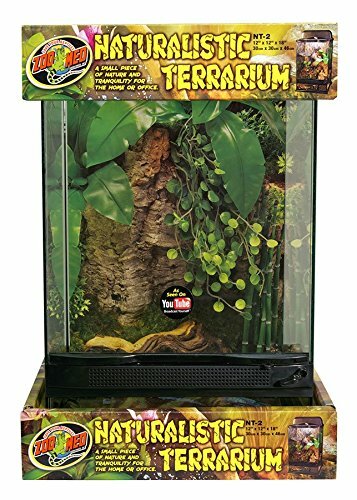 What is a Reptile Terrarium? A reptile terrarium is a home that is designed to hold reptiles or amphibians in a very controlled environment. Reptiles and amphibians both need very specific habitats and having certain heating and dampness needs as well. Having the right terrarium for your exotic pets can ensure their health and happiness. They are a little more difficult to take care of than traditional pets like a dog or cat, but for those who like the exotic pets, they can be really fascinating to watch. Different reptiles and amphibians have different care requirements so it is important that you know what your breed of pet requires in the way of housing and care. These things will include the housing they need, humidity requirements, water needs and other specifics. Housing is probably one of the mist important factors to consider and get right, although it does go hand in hand with food, humidity and the other factors too. The type of reptile terrarium your reptile or amphibian will need will be determined by how large they get, how their natural habitats are in the wild, how they obtain water and the climate requirements, both micro and macro. You must ensure that their habitat matches their habitat in the wild as closely as possible. This will ensure a healthy pet that will be around a long time. Make sure that you know how big the reptile or amphibian you own or are purchasing will get. If they are naturally small, a smaller terrarium will work just fine. Good examples of small exotic pets that work well in smaller terrariums are geckos and small turtles. If your reptile or amphibian is a snake or lizard of some kind, some breeds can grow quite large. Other breeds may want a lot of space to move around in. For this reason it is extremely important to know exactly what you have or are purchasing so there are no surprises as to the size it is getting and you are not caught unprepared with a pet that has outgrown its home. Reptiles are sneaky little things and if they can find a way out of their terrarium, they will. For this reason it is important to purchase a terrarium that has locking doors and lids. Sturdy construction is also a must. Some pet owners even put a little bit of petroleum jelly around the top rim to discourage the more determined ones from being able to get out. If you are setting up your terrarium for an aquatic, semi aquatic or tropical pet, one of the most important things to ensure is that the terrarium you purchase is waterproof. You also want the moisture to be contained inside it as well. Some of the designs, including a couple of the top rated models reviewed here, are waterproof on the lower portion and have front access as well. This is very good if your pets don’t like things coming down onto them from above their heads. A lot of reptiles and amphibians require a humid, moist environment that is like their natural, in-the-wild homes. If this is the kind of pet you have, you will need to use substrate that absorbs and re-releases the moisture without causing any bacteria to grow inside the cage. That is a very dangerous situation for your pet. If you need a humid environment, the terrarium needs to be fully enclosed in glass and not have a mesh top which will let the humidity escape. Keeping hygrometers in a couple of spots in the terrarium will help you monitor the humidity in the terrarium and keep it at the right range. Humidity is crucial for the breeds that require it, so you should take this seriously and maintain it at all times. There are a few ways that you can increase humidity quickly and also keep it at the proper levels on a regular basis. Increase the size of the water dish to add more moisture to the air. Include a misting system in the terrarium which will add moisture to the air on a regular basis or as needed. You don’t want it to become TOO damp either. Having a spray bottle around for emergency moisture adding is a good habit to have. This is not a very reliable method for long term humidity, but to increase it quickly, it works great. Putting moss or mulch in the terrarium (only mulch approved for terrariums and reptiles) is a great way to retain the moisture in the enclosure and increases the overall humidity as well. If you don’t know what substrate is, it is the flooring that you choose for the reptile terrarium. Choosing the right one will not only make the terrarium look better, it will also prevent the feces, urine, and any spilled water and food away from your pets. If you are going to use a substrate such as soil or sand, it has to be sterile initially so you do not contaminate the terrarium with any microorganisms that could make your pets sick. You could also choose to layer the substrate by using hydro-clay on the bottom which will accomplish two things: it will absorb excess moisture and also regulate the humidity in the terrarium. There are a few tips that are important to remember when it comes to the substrate in your terrarium. Choose easy to clean substrate that you will not put off keeping maintained. Also make sure that you can get the substrate you choose easily. How often you need to replace it will be determined by the size of the pet. Last but not least, use non-abrasive substrate so it will not scratch the reptile or amphibian’s sensitive skin. There are thousands of reptile and amphibian species. Many of them that are sold as exotic pets have become very popular. Having the right terrarium for them is an important part in keeping them healthy. Their systems can be very sensitive to improper care, so if you don’t have the time or money to spend on making sure they have the proper environment with the proper substrate, lighting, plants and more, you are better off with a different pet. If you already know what is involved in having reptiles and amphibians and are ready to get what you need, you’re in the right place. With all of the terrarium choices on the market today, it can be challenging to come up with just the right one. With the information provided to you in this buyer’s guide, you know how to choose the size of the terrarium, what to put in it, how to keep it humid, how to prevent escapes and much more. When you have all the right information, sorting through the different reptile terrarium choices becomes much easier. When they are properly taken care of, reptiles and amphibians are excellent pets that can provide hours of viewing pleasure. They are extremely fascinating creatures. Depending on the size, they don’t usually take up much space unless they are a large breed. They have very long life spans, so their terrarium is an investment, not just a temporary home for them. Take the time to go through the information in this guide, take a look at the top rated reptile terrarium reviews and then start the process of choosing that perfect reptile terrarium that will be your pet’s new home.